Home » Somalia » Somali Piracy: Is Taking the Fight to Land the Solution? Somali Piracy: Is Taking the Fight to Land the Solution? 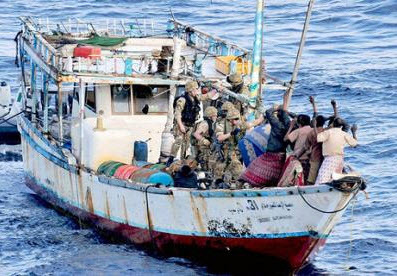 Piracy is not just a military issue, but a social, economic and political one. Royal Marines on counter-piracy operation near Somalia. Photograph by Kyle Heller, UK Ministry of Defence. Years of naval counter-piracy operations have so far failed to strategically defeat Somali pirates. The presence of more warships and armed guards on civilian ships have pushed pirates to adapt to the evolving situation. It was in this context that, on March 23, 2012, the Council of the European Union decided to extend Operation Atlanta (officially known as EU Naval Force Somalia) to allow military strikes on land. This new mandate represents a substantial step-up in operations and shift in strategy. The decision, which appears to have been a compromise between different European perspectives, allows soldiers to intervene in Somalia but only by helicopter, while no troops will be deployed on the ground. Despite careful limitations, however, the new mandate immediately raised criticism due to the high risks linked to such an aggressive policy. The escalation in the fight against piracy and the intensity of conflict with armed gangs might have unintended consequences, and perhaps revive bitter memories of ‘Black Hawk Down’ in 1993 when two US helicopters were downed by Somali militants. The first EU air strike on Somali soil on May 15, 2012 added to these concerns, as pirates threatened to kill the hostages if attacked on land again. Indeed, aggressive military actions carried out along the Somali coasts not only pose risks for EU forces, but could contribute to civilian casualties – as aerial surveillance can hardly make distinctions between fishermen and pirates. If Somali civilians were to suffer, local communities’ support for international actors would diminish and this could end up strengthening pirate gangs. There is currently no coherent onshore programme to tackle these highly complex issues. Although multilateral cooperation in the Somali waters has resulted in reducing the number of ships hijacked, a counter-piracy military approach without accompanying political strategies could prove counterproductive. For example, if piracy were made untenable but no alternatives were provided, it might push locals with few other options towards the Islamist militant group al-Shabaab. Indeed, it has been reported that piracy ransoms partly fund al-Shabaab. Addressing Somali piracy in earnest requires shifting from a military-centric strategy towards the implementation of a more comprehensive approach based on wide engagement with local and regional actors. Pirate gangs are embedded in economic, political and social life, and piracy represents a significant source of income for local communities and economic development. Piracy therefore continues to appeal to some from younger generations. Addressing the issue requires policymakers to take into account the presence of those numerous interest groups – some residents, local administrations, insurance companies, contractor firms and so on – in favour of maintaining the status quo. Crucially, tackling the roots of piracy will require the engagement of local actors and political reforms in order to guarantee effective governance and regulation. International efforts should therefore help to empower local administrations and authorities, such as in the states of Puntland and Galmudug, two pirate prone areas. In particular, judicial and law enforcement institutions are fundamental to suppressing crime and corruption and ensuring stability. The example of the newly-created Puntland Maritime Police Force (PMPF) is emblematic of this. Last May, the Puntland forces conducted successful anti-piracy operations along coastal towns in Bari, Karkaar and Nugal regions of Puntland State, forcing pirates to flee. However, it must also be pointed out that the PMPF, which is also engaged in fisheries protection and humanitarian aid, lacks robust financial assistance. And the same problem exists in neighbouring Galmudug, where international organisations are not sponsoring and supporting local institutions. As well as law enforcement, however, it is important that efforts are made to enhance local economic development. Building and developing coastal infrastructures could prove to be a decisive step in involving communities in Somali economic life and creating more legitimate opportunities for residents. There is a need for programmes aimed at creating job opportunities, in particular empowering local fishermen and the fishing industry, and setting rules and authorities regarding Somalia’s waters administration. These strategies should be implemented by Somalis themselves and possibly by local NGOs, through a partnership between the international community and Somali authorities.